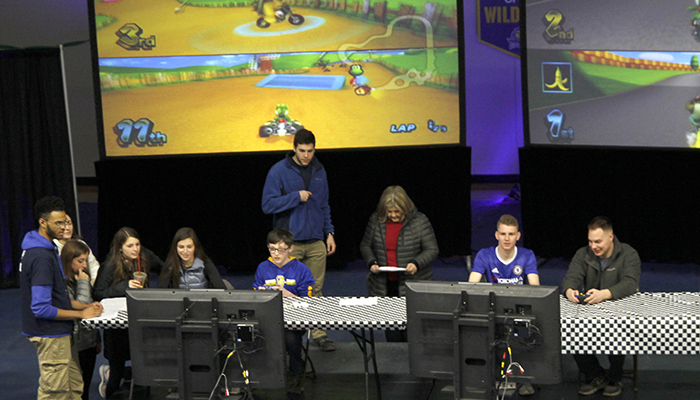 On Saturday, April 14, the Cazenovia College Sport Management Senior Capstone class hosted a Mario Kart Extravaganza, an eSporting event for local gamers to compete in, or play for fun. The proceeds of the event are hoping to be donated to a local hospital to build a GO Kart for children who are hospitalized. A GO Kart (Gamers Outreach Kart) is a portable medical-grade kiosk that provides bedside recreation for children who can't leave their hospital room. The GO Kart is an easy way for hospital staff members to wheel an Xbox from room-to-room. The only setup involves plugging it into the wall outlet. This allows children to participate in the fun of video games, a pleasure they usually do not have in the hospital. 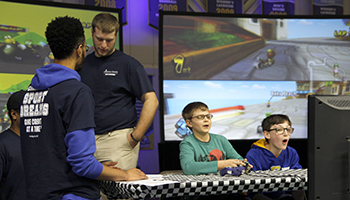 The Sports Management capstone students were first introduced to the GO Kart in January, when eSports Consultant Shi Deng visited campus to discuss the work of his company, Big Blue Esports. A GO Kart fundraiser aligned perfectly with the class's initiative. During Deng's visit, he discussed the future of the eSport industry. "ESports is growing at an explosive pace, however a majority of the focus is at the pinnacle of the games. As eSports grows, there will be an increasing need for skills that support the industry including management, event production, tournament organization, and league operations. Infrastructure growth will pave the way for the burgeoning collegiate leagues across the country as we see many schools explore educational programs and forming official teams," comments Deng. The fundraiser's 24 participants helped the class successfully raise $350 of the $3,500 needed for a GO Kart. The students plan to keep the fundraiser open for future capstone classes until their goal is met and they have funded a GO Kart. Along with the money raised at the event, the Sports Management students’ also had goals of increasing awareness of eSports on campus, along with creating connections with community businesses including Town Tech, Caz Bagel, and Subway. Sport management program director and assistant professor, Tracy Trachsler comments about the uniqueness of this project and the positive feedback of this event in its first year. "This is different from other capstones on campus and previous Sport Management capstones, because we focused on a niche sport that is legitimizing before our eyes in the professional and amateur sporting worlds. We now have one event under our belts and hope to capitalize upon the positive feelings from this one to grow the event in future years." Trachlser also comments that she and her students are hoping that this is only the beginning of many gaming competitions on campus in the years to come.